It seems like I have been searching for the right foundation forever, and by golly I think I've only gone and found it! I give you Estée Lauder Double Wear foundation. Nothing new I hear you say, but it is to me and I am in love with it. I have oily, freckly skin with open pores, bummer, I obviously wasn't around when they were handing out the gorgeously smooth, olive toned skin, so hey I guess I have to deal with it. My freckles have faded quite a bit as I've got older but still cause me problems when trying to the get right shade for my face. My face always ending up a totally different colour to my neck no matter how much I blend. I've been to numerous cosmetic counters, explaining my problem, the assistant saying she understands and knows just the right one for me, only for me to walk out, purchase in hand and then be disappointed over the next few days when I realise that the shade is totally wrong and in the foundation grave drawer it goes with all the rest of them. What is it with these women in department stores that insist on making you look like you've been either been tangoed or your face has been to the Bahamas without the rest of your body!!! I've tried budget foundations too but never found 'the one'. 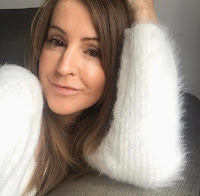 The closest I got to perfection recently was with the Chanel Perfection Lumiére, which I purchased after lots of research and reading reviews online. The most helpful and friendly Chanel assistant advised on the perfect shade (25 Beige) and I actually used this for a couple of months. I got on well with it but just found it wasn't giving me the coverage I was after. Yes, with my combination skin, along come spots too, aren't I the lucky one! Maybe this is a foundation more for the summer? It was back to the drawing board and after reading a couple of blog reviews on the double wear, I popped along to John Lewis to try it myself. The store where I live will now always be my go to department store as the cosmetic area is right next to huge glass windows letting all the natural light flood in, putting a stop to woman walking out two-tone! I was given a sample of 1W2 Sand, to take home and try for a few days. I've heard, 'I know the perfect shade' so many times but this time she was spot on. It is the perfect shade for me. Now comes the review part after all my waffling. Shade perfected, onto the coverage. I personally think this foundation gives amazing full coverage without it looking caked on, or too much, it's light and natural looking. The beauty for me too is that it's oil free, I don't really want to be slapping another oil slick on top of what I already have now do I? It's a long lasting foundation, comfortably staying in place for up to 15 hours so they say and doesn't rub off on clothes. I put this on every morning at 7.30am and it certainly does have great staying power, it still looks good when I get home at the end of the day, not like it did first thing in the morning but it's still in place and I'm not complaining. I'm also finding that I'm not needing to touch up with face powder like I had to with other brands, in fact I hardly put any on at all. It also claims to withstand heat, humidity and sweat, so that will be tested when I go away in a few weeks! Another little bonus is that it contains SPF10 too! I try and get a light, but full coverage, if that makes sense, by applying with my beauty blender sponge. A little goes a long way too using this method. Applying with a brush certainly gives a heavier finish. When I purchased this I was asked if I wanted to buy their cleanser as this particular foundation was more difficult to remove. (I think because it's water resistant) I delcined that sales pitch as I use an oil based cleanser anyway which works perfectly well at removing all traces of it. I think you'll definitely need an oil based remover or wipes if you're thinking of buying this. It does provide a perfect base for make up, but is semi matte so you need to add blusher/bronzer so it doesn't look completely flat. The real test for me and this foundation holding up is the fact that for various personal reasons I have shed tonnes of tears over the last couple of weeks and wow, even after mopping my tear stained face with soggy tissues, my face still looked good and that is some achievement. I haven't got anything negative to say about this foundation and will definitely be purchasing again and again and there are so many shade options available (currently around about 30!) so you should have no problem finding the right one for you. Click here to see the colour palette and check out the 5star reviews.